*****RARE FIND SPECIAL EDITION GRAND CHEROKEE LAREDO INCLUDING LIMITED EQUIPMENT PACKAGE 1 OWNER 94K MILES BLACK ON BLACK LOADED 4X4****BUY WITH CONFIDENCE FROM NEW JERSEY'S #1 RATED PRE-OWNED DEALERSHIP. 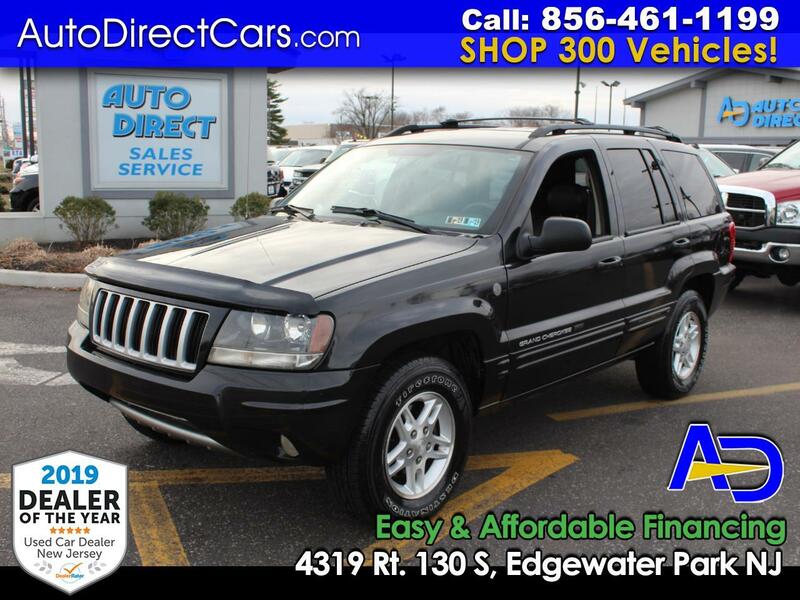 CHECK OUT THIS 2004 JEEP GRAND CHEROKEE LAREDO 4WD 6CYL AUTOMATIC 4-DR SPORT UTILITY. CAR FAX CERTIFIED 1 OWNER. THIS TRUCK IS IN VERY GOOD CONDITION, WELL MAINTAINED & RUNS AND DRIVES GREAT. BLACK METALLIC EXTERIOR WITH BLACK LEATHER INTERIOR. LOADED WITH ALL FACTORY OPTIONS FEATURING SUNROOF, ALLOY WHEELS, POWER SEAT, POWER LOCKS, POWER WINDOWS AND MORE. 94,432 MILES IN ALL ORIGINAL CONDITION DRIVEN APPROXIMATELY 6K MILES PER YEAR. THIS IS A RARE FIND AUTO DIRECT CREAM PUFF. TRADE INS WELCOME. STOP BY & VISIT OUR HUGE INDOOR SHOWROOM.